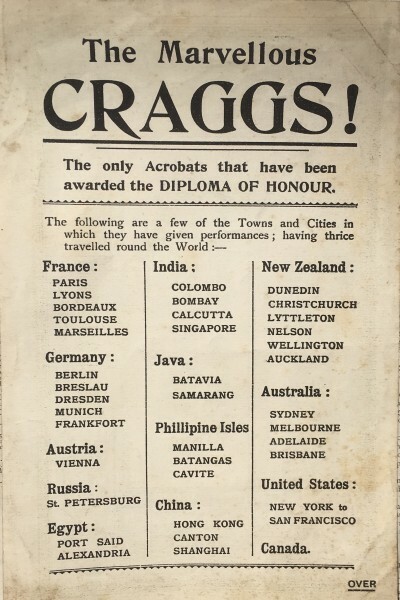 Join Edward Cragg in the family’s Kennington gymnasium and home of four decades as he tells the true story – illustrated with magic lantern slides, early film, colourful posters and souvenirs – of the finest acrobatic troupe of the Victorian and Edwardian era. 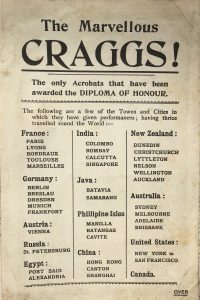 Feted by the Folies Bergere, courted by Barnum and filmed by Edison, the Craggs toured the world for fifty years, from the 1860’s to the end of WW1, astounding and delighting audiences everywhere. Discover the circuses, pleasure gardens, glittering Empires and Alhambras of the Belle Epoque in this Lambeth Heritage Festival event commemorating the start of circus 250 years ago in Waterloo. Researched and performed by Charlie Holland, himself a long-term Kennington resident and former circus performer and Programme Director of The Circus Space (National Centre for Circus Arts). Doors open at 18.30, for a 19.30 start. 90 minutes including interval.